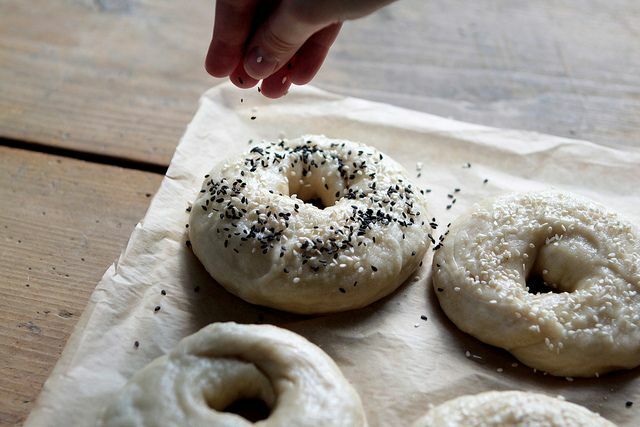 Today: Making your own bagels takes some time, but it's easy once you get over your fears. Thankfully, Kenzi holds our hand throughout the whole process, with a recipe and step-by-step instructions. 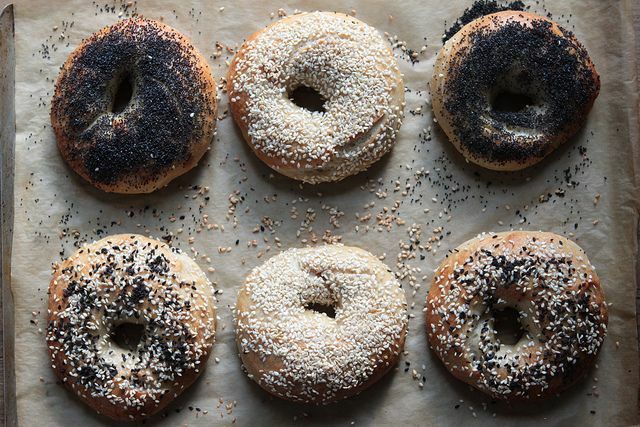 The only thing you can do to mess up making your own bagels is to make them, say, square. This is a promise -- the secret to good bagels is that there really is no secret, other than you don't have to be anywhere near New York City to have perfectly chewy, fresh bagels for breakfast this Sunday morning. More things that aren't true: that it's the New York water that makes them what they are, that you'll kill the dough by squeezing, forcing it into a bagel shape, that they're too high-maintenance and you'll go running (screaming) back to the grocery store standard. Please don't do that. 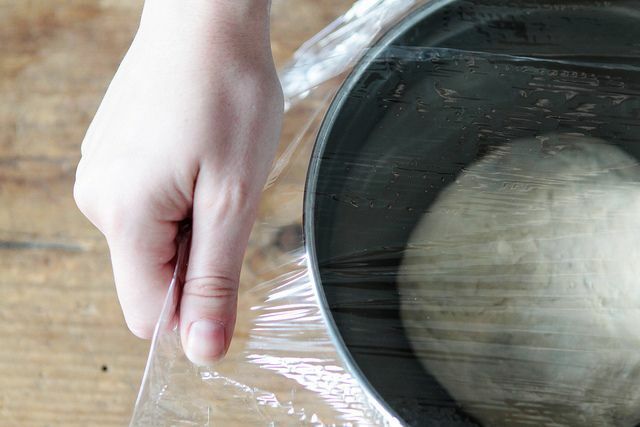 If you've ever mixed and kneaded any other dough, this will be a breeze. Let's do it together. Note: This recipe is adapted from one by the bread man himself, Peter Reinhart. (Why mess with a good thing?) I use all-purpose flour, but you can swap any amount of it with whole grain flour (like rye or wheat) for a different flavor. Reinhart also uses barley malt syrup, as do most serious bagel people, but honey works just as well. Shall we, then? 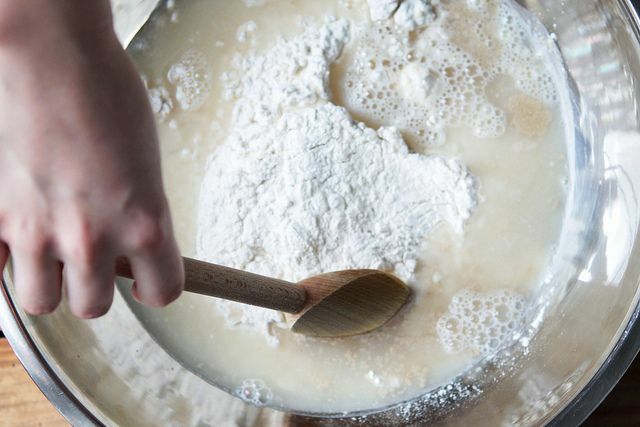 Mix the flour, 2 teaspoons of the salt, the yeast, honey, and the water until everything begins to form into dough. You can use a mixer if you like, but it's simpler by hand. It'll be a stiff dough, as there's not much water, but this makes it sturdy enough to withstand a dunk in boiling water later. Feel free to add a bit more water if necessary, but you shouldn't need much. 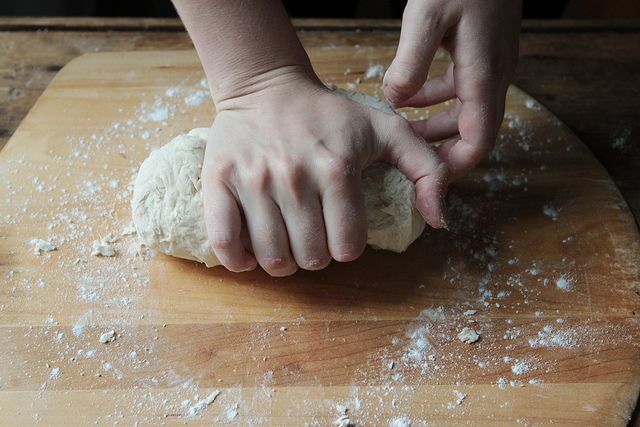 Let the dough rest for 5 minutes while you find a place in your tiny apartment on which to knead. 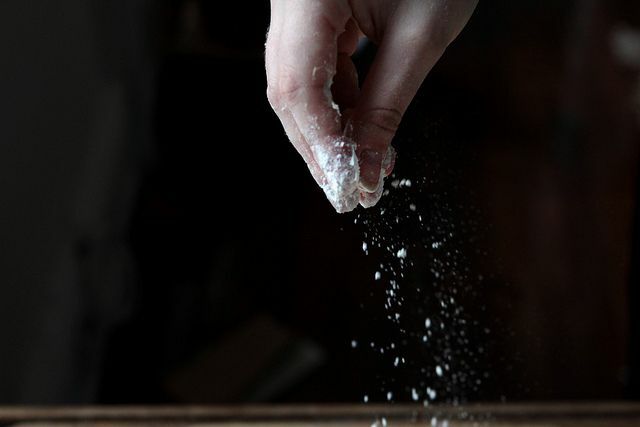 Knead on a floured surface for about 3 minutes -- the dough will get smooth, a little tacky. 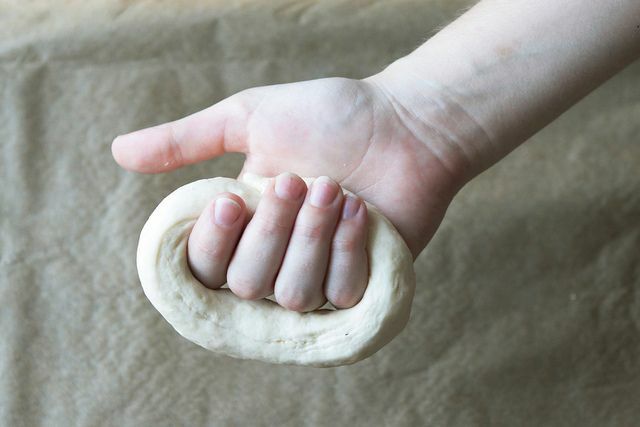 To shape the bagels, place one end of one dough log in between your thumb and forefinger, and then wrap it around the rest of your fingers -- the dough ends should overlap by an inch or two -- and squeeze it slightly to bind it together. Once you do this, you can also roll the ends together on a surface to enhance the seal. Extra security is never a bad thing. Repeat for all of the bagels, then lightly oil them and cover with plastic wrap. Put them in the fridge to proof overnight. Invite guests over for brunch. About an hour an a half before you want to bake them, pull the bagels out of the fridge to come to room temperature, and fill a large pot (I use a Dutch oven) with at least 4 inches of water. Cover and bring it to a boil. When it boils, add 1 teaspoon of salt and the baking soda, then turn it down to a simmer. 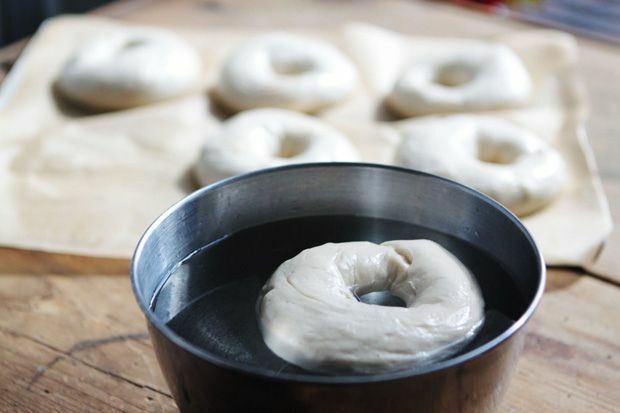 Crank the oven to 500° F.
Now test the bagels by using the float test: fill a bowl with cold water, and place one bagel in it. If it floats, they're all ready to go. If not, you haven't failed: just return it to the baking sheet and let proof for 15 to 20 minutes more, then do the test again. Onto the boil. If you do not do this, in the opinion of many, what you're making is not a bagel -- it's a round roll with an unexplained hole. So never skip this step. 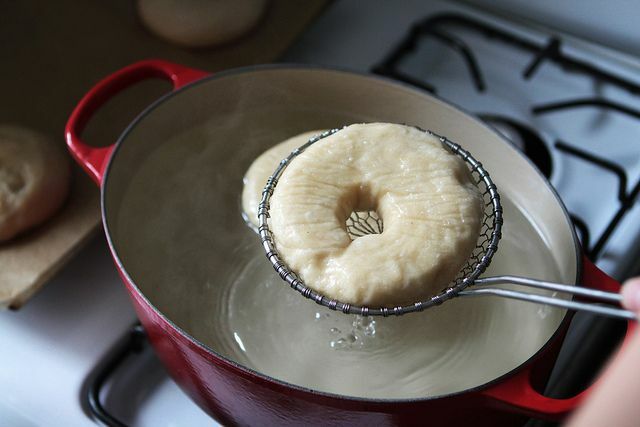 Working in batches that will fit in your pot, carefully drop each bagel into the simmering water, let poach for 1 minute, and flip with a slotted spoon or a spider. Poach 30 seconds more, and then return each bagel to the baking sheet. You're so close: slip them in the oven and reduce the heat to 450° F. Bake for 8 minutes, rotate the sheet, and bake 8 to 12 minutes more, until the bagels are golden brown. 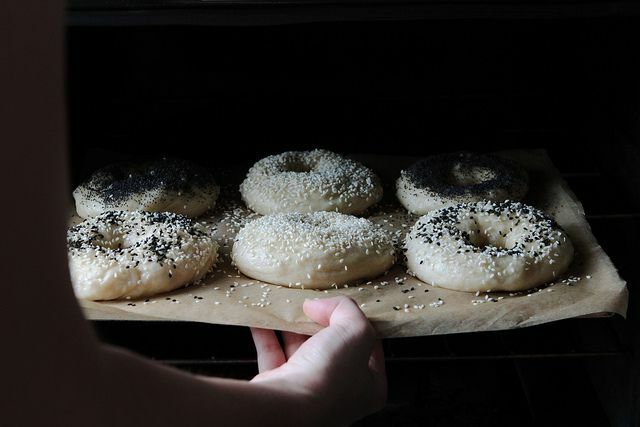 Feel free to check the bottom of the bagels as they cook -- if they're getting too brown, just stick another baking sheet underneath them (a baking stone works, too). Pull them from the oven, and wait an excruciating 30 minutes before you eat them. Now off with you -- go make bagels and take Reinhart's baker's blessing with you, modified just slightly for bagel-making: may your crust be chewy, and your bread always rise. A question. I didnt own an oven but a toaster. What if i toast them after boiling in order to 'bake' them instead? These were absolutely delicious! I made them for my mom for her birthday, and they were gobbled up in moments. Also, my bagels never floated in the water, but I tried forging ahead with the recipe anyways. They turned out excellent regardless. Very happy with this fairly fool-proof recipe. Very novice baker here--interested in trying this recipe, but have to ask, what is an oiled boil? "Now put your lovely little dough ball into an oiled boil, cover it with plastic wrap, and let it hang in the fridge..." It's the only part of the recipe that wasn't clear to me. Hoping for a good weekend day coming up when I can try this! Hi there. Just tried making these today and I'm not quite sure where I went wrong. The crust is really hard and quite hard to chew on them. The inside looks uncooked a bit and the smell of flour is pretty strong. Would love to get your feedback. Thanks! These were a hit at the breakfast table - made sandwiches w/ scrambled egg, avo, & cheddar. Thanks for the wonderful recipe! I just made these surprisingly simple bagels and loved them. Delicious! i made them twice, and I loved them! How strange that you say that you don't bake bagels. One of my best girlfriend's grandfather was a baker in NYC for more than 40 years making bagels. After he boiled them he would bake them to brown them. I sure would hate to be the one to tell him that he grew up making bagels wrong when his family had a successful bakery. These are not real bagels. You don't bake bagels. A baked bagel is not a real bagel and definitely does NOT taste like a real bagel. This is bread with a whole in it, not a bagel. So what's the way to do it then? I'd really like to know as I'm a big fan of bagels but can't get any good ones in my part of town! Yes, Bagels are baked. After you boiled them. If you were to just boil them they would be similar to a Boehmische Knoedel, which is yeast dough boiled in water until it is cooked through. The only thing that is not quite 'real' about this recipe is the substitution of honey for malt extract which makes the recipe much more approachable but could be easily adapted. Generally speaking though, isn't the joy of cooking and baking that you adapt recipes, old staples get developed further and you can just make things however you like them! A lot of recipes develop further when people migrate to other countries for example. Take the 'German Chocolate Cake' that I come across in the US frequently. Not how we eat chocolate cake at all here in Germany, but nevertheless very tasty! Or take American made Gouda cheese, tastes quite different to the Dutch original, but hey, tasty cheese, so who cares! Very well put, Franziska. Thanks for weighing in! Franziska, German chocolate cake is called liked that not because it came from Germany but because the last name of American baker who created it was German! These are the best homemade bagels ever! And dare I say, the best bagels I have eaten outside of NYC, or at least this side of the Atlantic. I made plain (yes, yes I know, boring... but oh so yummy) and Za'atar Bagels. Both were amazing. Thanks for the fantastic recipe! Amazing recipe Kenzi! I had come across the Peter Reinhart recipe before but never attempted it because high gluten flour and barley malt is virtually impossible to buy here, at least not on a university student's budget. I've just started making these, and was wondering if anyone has ever attempted to freeze these at any stage of the preparation process. I was contemplating to freeze a couple before the boiling stage. Or has anyone attempted to freeze them once baked? Thanks for the quick reply breadwhisperer! I have just 'put them to bed' in the fridge and can't wait to bake and freeze (some) tomorrow! Greetings from Germany! ha! and a third thing. 30 minutes after coming out is WAY too long. in our cool Bay Area climate the bagels were cold after 30 minutes. 15 minutes sets them and cools them down but they're still warm! and one more thing: I did not have rapid rise yeast the first time, so I used a common substitution table to use the regular yeast I did have. I found the bagels a touch soft, but otherwise fine. I've now made this recipe twice. thank you for it, it tastes great! I have a few learnings that might be good to add to the recipe. 1. Please mention the best water temperature. Room temperature to me is 72 degrees, and I discovered that the yeast would not rise with water at that temperature. 2. If for some reason you wake up in the morning and the dough has not risen, you can proof it in the oven like this: a) set oven to 200, but turn it off after 10 minutes. Put bagels in the oven for 15 mins, check if they float. 3. You can make garlic bagels by mincing garlic and putting on top. Note that a garlic press makes a strange paste that just doesn't cook up right. a little olive oil can coat the garlic and help it stick or if you're a purist just leave it on and let it toast right up. 4. Please include the instructions on how to make egg bagels. 5. you can buy barley malt syrup online, or at your local health food store. I discovered that barley malt syrup is also used in the popular "make your own granola bar" recipes, so it was a good investment. Authentic Montreal bagels are excellent, baked in a wood-burning oven.many people prefer them to New York bagels. I believe the bagel is poached in honeyed hot water before it is baked. My husband is on a low salt diet but loves bread of all kinds. Would it work to cut the salt in the dough by half? I find it works in most bread recipes. Sorry Kathi, my computer has developed a mind of it's own. There will be a slight change in taste, but it won't be a bad taste, just a little blander. Usually there is no need to reduce the salt in bread recipes unless he eats a lot of bread, but if you wish to do this, it is ok. So, I made these over the weekend, they were easy and very nice, but, they are just rolls, not bagels, not even pretzel like. Next time I will use the recipe I have forgone since it has the malt extract. I will just pay for shipping and store it in my freezer. They are very nice rolls though, delicious, but not bagels. I finished baking these this morning. 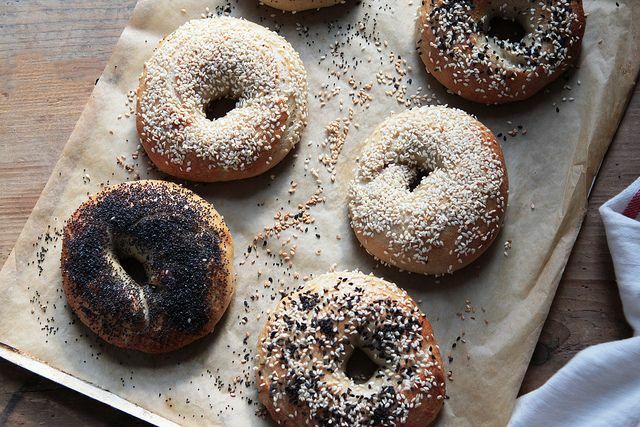 I will never eat store bought bagels ever again now that I have this recipe! It is incredibly easy and uses ingredients I already have in my kitchen. Thank you so much for posting this! This makes me so happy. Onward, homemade bagel revolution! Do you need to, and if so, how would you adjust this recipe for high-altitude cooking?